Kevin Wade, the new associate vice chancellor for student affairs, was, by his own admission, living his best life in Oakland, California when a search firm contacted him. Not realizing that Wade was a 2002 Elizabeth City State University graduate, and not telling him the name of the institution for which they were recruiting, he was invited to consider applying for the position of associate vice chancellor of student affairs. At the time, Wade was the Dean of Student Services for Laney College in Oakland. He’d been there three years and he was happy to be there. The recruiter asked Wade to think about whether or not he would be interested in applying, and she would contact him the next day. “When she called me back, she told me that she didn’t realize that I was a graduate of ECSU,” recalled Wade, adding that once he realized that the position was here, at his alma mater, the decision to apply was an easy one. Wade grew up in nearby Halifax County. He came to ECSU in 1998, but it wasn’t until his sophomore year that things began to click for the political science major. He recalls that it was then that he realized he would get involved in campus life and benefit from the direction of the people running the Division of Student Affairs. Wade says as he observed the student affairs professionals, he realized that what they were doing was a career, and he could be a part of that. 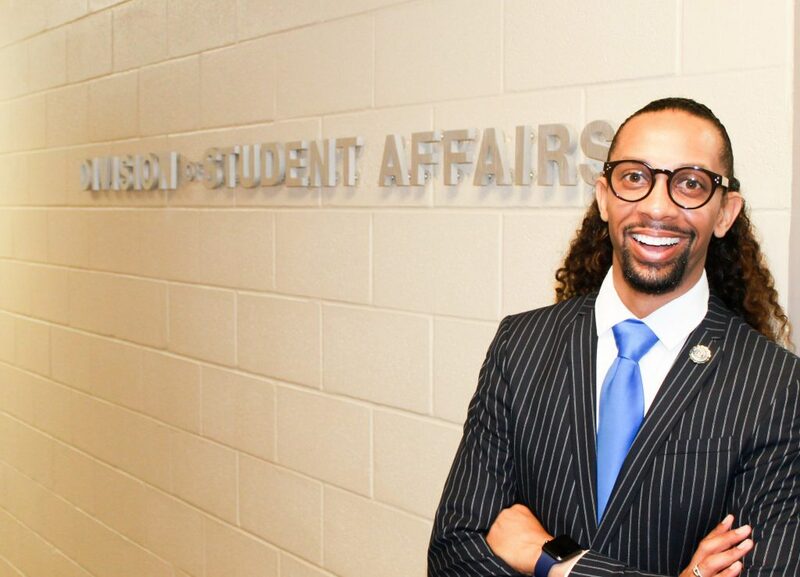 “My sophomore year, I decided I wanted to be an associate vice chancellor for student affairs,” said Wade. And his career path was set before him. Wade would graduate from ECSU in 2002 and work on campus as the coordinator for leadership development and commuter students. He recalls that it was the first time the campus was faced with a majority of students commuting – 53 percent of the student body were commuters – and services needed to be established to address their needs. “We knew that we needed to keep those students engaged,” he said. Wade would go on to spend eight years working for community colleges in Maryland and California before accepting his current position at ECSU. He’s also been working on his Ed.D in higher education leadership from Morgan State University. 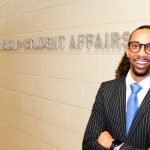 While a student at ECSU, Wade would be involved with the Student Government Association, Greek life, a number of organizations, and become the first official Mr. ECSU. His experience on campus is something that he believes he can share with current students and offer them the same opportunities ECSU gave to him. “I’m here to carry out the vision of the institution and provide a great experience for our students,” says Wade.